Gutter play, in its various forms, has become a necessity with the advent of designer “sport” oil patterns. Many bowlers lack the knowledge or the skills needed to know when to play the gutter or even how to play the gutter. Part 1 of this three-part series dealt mostly with the “why” of playing the gutter, and when to stay away. Notice that I said “three-part series”. When I wrote part 1, I thought it would only be a two-part series, but I am going to extend it to three. I just have too much information to share to fit it all into this issue. In parts 2 and 3, I want to cover the all-important “how” part of gutter play, and help BTM readers overcome the physical and mental challenges involved in playing the gutter. Part 2 will focus mainly on playing the “twig” and part 3 will focus more on the “bank shot”. In part 1 of this series, I made the statement, “Believe it or not, there is a line running across every lane in America at the 40 foot distance.” Seeing this line is based on finding the reflection of the bottom of the masking unit on the lane surface. I said that line is always at 40 feet. It is not. 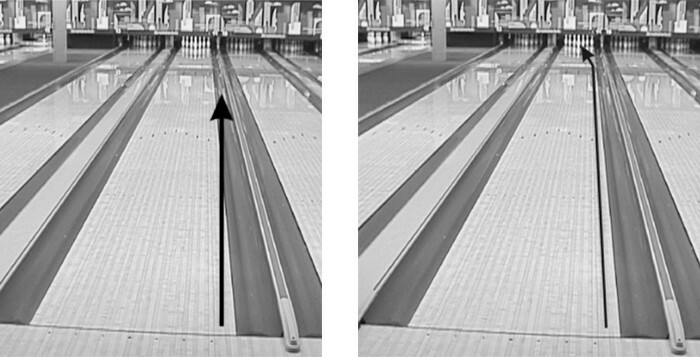 I was informed by the ever vigilant Susie Minshew that she found several bowling centers where the distance between the masking units and the pins varied greatly, and that would of course move the reflection line. I want to thank Susie for bringing this to my attention. I will investigate further, but even if the line is sometimes moved farther down the lane you can still use it to compare skid distances. The “twig” means that you are only using the first three or four boards of the lane for the first 35 to 40 feet of lane length. For example, the ball is laid down on the three board at the foul line and stays outside the four board until it starts to hook toward the pocket at 38 feet. It has been my experience that very few bowlers are able to play the twig or have enough confidence to play there when there is pride and treasure on the line. Playing the twig is the most difficult form of gutter play because it challenges both your physical and mental game. Playing the twig challenges you psychologically, because it looks―to your eyes―that every ball is going straight into the gutter, and you have to overcome the very real fear of throwing gutter balls. The easiest way to learn to play the twig is to find a coach that has experience in teaching bowlers how to play there. I understand that those coaches are few and far between, but if you can hook up with one, it will be well worth the time and money. If you must go it alone, at least see if you can find a bowling buddy that would be willing to help, and maybe even learn at the same time. Other helpful items are a video camera and a plastic ball. You need enough oil near the gutter to skid the ball the first 35 feet or more; but I know that most of you will be forced to learn on a league shot, which is usually very dry out near the gutter. A plastic ball will usually give you the skid you need. A video camera will go a long way toward teaching you not to believe your lying eyes. More on that later. The first step in the learning process is to figure out what board you need to finish on in order to lay the ball down on the proper starting board. This is where your bowling buddy comes in. Have him pay close attention to which board your ball actually lands on, compared to which board you slide on. For a righthanded bowler, use the right side of your slide sole for the comparison, not the toe. For example, if you were to throw a shot and the inside sole of your slide foot ended up on the left side of the ten board, that’s your slide board. If your ball actually landed on the five board at the foul line, then your “laydown” is five boards right of your slide board or slide foot. I believe some bowlers call this your personal number. I suggest you start out learning to play the three board. So if your laydown is five boards and you want to land the ball on the three board at the foul line, then you need to slide on the eight board. Target board is three, plus laydown is five, five plus three equals eight. This means that any time you are playing parallel to the gutter and you want to figure out what board to slide on to make the shot, just add your laydown number to your target board. Back to learning to play straight down the three board with a five board laydown. Start out just concentrating on sliding on the eight board, no matter where the ball goes. A lot of bowlers have a tendency to walk away from the gutter as they approach, even if they don’t normally have a drift. As you approach, it looks like the ball is going right into the gutter to your lying eyes, so subconsciously you walk away from the gutter to keep that from happening. If you can’t seem to stop walking away from the gutter, then try putting a piece of tape on the eight board and try looking at that during the whole approach. Just look at the piece of tape and try to make yourself slide on top of it. Making a few approaches without the ball can help as well. In the photos, you can see the difference between what your eyes will see and what will actually happen if you do everything correctly. Two common mistakes people make (because they believe their eyes) are lofting the ball farther out onto the lane than usual and throwing the ball harder than usual. Because it looks like the ball will land right into the gutter, beginner gutter rats will tend to hold on to the ball and loft it out thinking that will help the ball land on the lane, instead of going into the gutter. It’s just an illusion. The gutters don’t really point in the way they look. I actually believe most bowlers are more accurate if they lay the ball down early. That seems to take even more faith, because we are releasing the ball totally out of our vision. If you think about it, when we throw a baseball or football we actually release the ball within our vision, but a bowling ball should leave our hand at the bottom of the swing…well before our vision can pick it up. I think bowlers tend to throw the ball harder when learning to play the twig because they think it will make them more accurate. If anything, it makes you less accurate. Just have faith that the ball will stay on the lane, and lay it down early with the same speed you always do. This is just bowling slang that means the ball leaves your hand on a trajectory that heads it toward the headpin instead of down the three board parallel to the gutter. This is another case where your bowling buddy (or video camera) can verify that you threw the ball uphill and it didn’t just hook off of the gutter immediately. Sometimes when there is very little oil on the gutter, it’s hard for the bowler to tell the difference. Bowlers tend to throw the ball uphill when learning to play the twig for the same reason they tend to walk away from the gutter. Your lying eyes tell you the ball is going to go into the gutter so you tend to “pull” the ball inside your target line. Often the best remedy is to simply try to throw the ball into the gutter. It’s harder than you think! I guess I should point out that you should not be using your best ball when you are learning “gutter play” because sometimes you may get a chip or two in it. The goal is to be able to land the ball on the three board and have it stay on the three board at least halfway down the lane. If your bowling center allows targets, you can put out two tape targets on the three board 15 feet apart and see if you can hit them both with the ball. Once you master that, try moving the tape to the two board and see if you can go down that board. You can even practice on the one board but expect the ball to hook off that one pretty quickly. I suggest you try looking at different spots up and down the lane to see what works best for you. Some people find it helpful to look a little farther down the lane than they normally target. I myself look at the very edge of the lane surface if I am playing really close to the gutter. If I am having one of those days where I tend to throw the ball uphill, I will actually look at the center of the gutter, and sometimes make a small change in my swing. It feels pretty strange to look at the center of the gutter, yet see the ball ride the edge of the lane for 38 feet before hooking toward the pocket. I have taught a few bowlers to play the twig with their eyes closed from the top of the backswing to the release. That nearly eliminates the “lying eyes” effect and builds confidence. I suggest that you try the twig during your practice time before every tournament. I also suggest you wait until you are warmed up before you make the attempt, because it does require you to be on your game. There is not a lot of room for error there. As to when to play the twig… you will know it. It will be easy as pie and you will actually have a little room for error. The one board will bounce the ball back toward the pocket if you hit it, and you may even have a little hold for the tug shots. There is an added bonus that you may be the only one playing there, because so few bowlers are capable. The real danger is playing the twig when the oil pattern is a little too long for it. This will result in washouts and the dreaded 2-8-10 split for righthanders. Don’t try to force the twig to be there when it’s not. I see a lot of bowlers fall into that trap because two balls make it back to the pocket, but the third one…not so much; that’s the “sucker bet”. Don’t be afraid to try the twig on one of your fill balls in the tenth frame after three or four games, unless you are bowling on a really long oil pattern. Sometimes the shot will develop, even if it was not there in the beginning. If you will remember back in part one of “Gutters, twigs, bank shots and sucker bets”, I reported that sometimes you have to pretend that the three board is the one board. This is the case, when playing parallel to the gutter is the right place to play the pattern, the one board was either too slippery or the oil was skidding the ball just a little too long. Once you have learned to play straight down the two or three board, then moving in a little and playing straight down the four or five board is easy. Just move your target and feet the same number of boards to the inside, and play the same as you did on the twig. How you actually roll the ball makes a big difference in the effectiveness of your gutter play as well. Often when playing parallel to the gutter, it is better to roll the ball more end over end with say 30 degrees of axis rotation instead of 45 degrees or more. This is especially true if the ball is too eager to head to the center of the headpin instead of the pocket. Getting the ball to “burn up” (lose axis rotation) just right often takes some finesse with the release, but makes a good substitute for a lack of hold from the oil pattern. Sometimes the remedy is as simple as spreading your little finger and index finger wide when you hold and release the ball. This will help the ball read the lane a little sooner and burn up a little faster. Conversely, if the ball is not making it back to the pocket because it is burning up too much, then a little more axis rotation will go a long way toward solving the problem. It’s also important to know how your different balls react when playing the twig. One may be going a foot too long, but a lower RG ball or one with more surface may be just right. 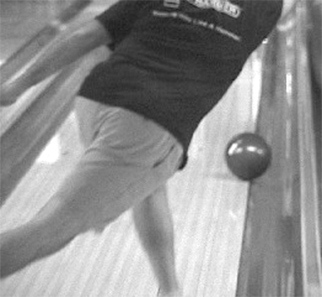 Keep in mind that playing the gutter is totally different than any other type of lane play, so you should practice it every time you practice. Even if there is not enough oil on the gutter to support very much skid, you can still practice laying the ball down in the right spot and in the right way. Your brain needs to be reminded not to believe your lying eyes, so your feet will cooperate and slide on the correct board, and your armswing will not go uphill. If you don’t practice the twig regularly you will not have the guts or the skill to jump out there when there is pride and treasure on the line. If you play the twig you will throw a gutter ball now and then, but it will be worth it. Living life on the edge (of the lane) can be very exciting when that gutter shot is there. Your scores will go sky high and you will amaze your friends.